Yeah, the locals call him "Street Angel". The cops have another name, "The Vigilante". To the local thugs he's just "that #$%@&!" Flying and darting through the crowd with a growing armful of purses. 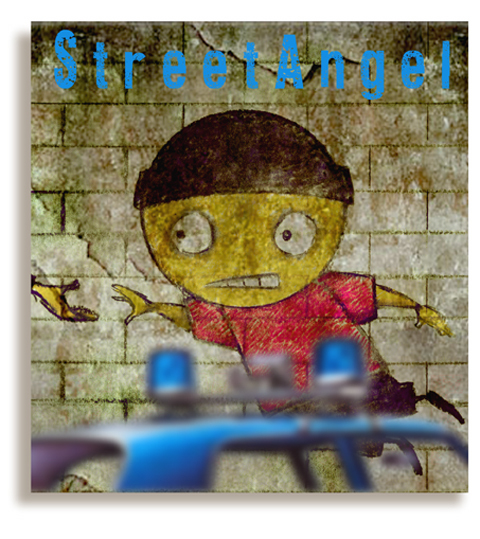 It's Street Angel. I thought the "Street Angel" was the hand to the left reaching out to the distressed. That is correct. The hand on the far left is trying to help. I’m shocked, I need to say. Really seldom do I go through a blog that’s both educative and interesting, and without a doubt, you might have hit the nail on the head. Your current concept is definitely outstanding; the thing is whatever insufficient people are talking intelligently about. I will be happy that found it within my try to find something relating to this. Hey Im from germany and would like to use some of your article on my blog would that be okay? Thank you. What would many of us do without the presence of the amazing ideas you share on this website? Who has got the endurance to deal with vital topics just for common subscribers like me? I actually and my pals are very delighted to have your web blog among the types we typically visit. It is hoped you know how a great deal we love your effort! Best wishes through us all. Pretty good posting here,. I by no means thought of that I'll catch any info like that ,but your put up really help me.Superior things are sharing here.I like your submit ,Now I am waiting in your subsequent post.So keep writing. I real delighted to find this internet site on bing, just what I was searching for : D also saved to favorites . Really, your piece goes to the nitty-gritty of the topic. Your clarity leaves me seeking to know more. Just so currently know, i'll immediately seize your feed to keep up presently along with your internet site. Sounding Out thank you is just my little way of saying bravo for a solid resource. Accept my greatest needs for your incoming post. This page contains a single entry from the blog posted on November 28, 2010 2:37 AM.